Professor Layton and the Diabolical Box is a sequel to 2008 DS sleeper hit, Professor Layton and the Curious Village. Does this unique blend of story and puzzles work as well the second time around as it did the first? Yes, I think it does. Professor Layton and the Diabolical Box starts off like Professor Layton and the Curious Village, with a mystery. Except this time there is a box that kills people. Okay, let me explain. There is a box, called the Elysian Box, and everyone who opens it has died. At the beginning Professor Layton and Luke get a letter from Professor Layton’s old mentor, saying he has gotten ahold of said killer box. However, when they arrive it is already too late, Professor Layton’s mentor is dead. 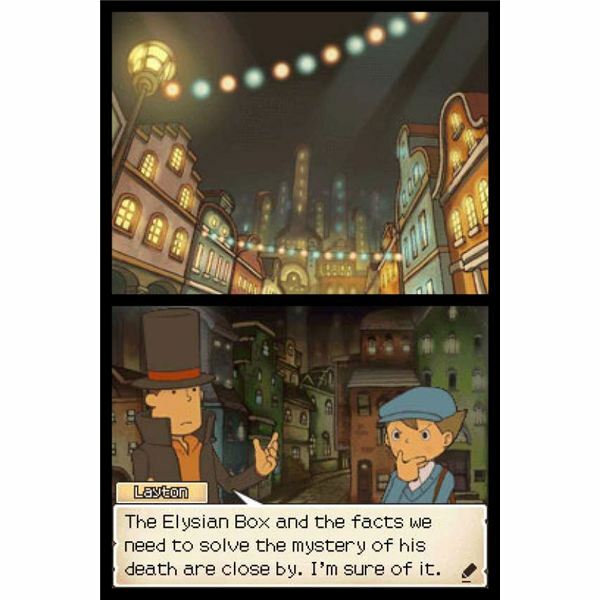 The box has done it’s job and now Professor Layton and Luke have to find out the truth behind the Elysian Box. Just like the previous game, there are mysteries within mysteries in Professor Layton and the Diabolical Box. In order to follow the story you really must stay on your toes. Professor Layton and the Diabolical Box plays just like the first game. You control Luke and the Professor by tapping the foot icon on the touch screen (the controls are all touch screen) and examine each environment you come to by tapping on items and people. This is standard DS adventure game controls. By tapping on things you can get either hint coins, which help you solve puzzles, clues to help you solve the mysteries or a puzzle to solve. If it’s a puzzle, a little red exclamation mark pops up. While the puzzles aren’t the same as the first game, they are in the same vein. They will usually have something to do with the dialogue or the environment (albeit loosely) and consist of a physical puzzle, such as moving blocks, a math puzzle (word problems, anyone?) or a brain teaser. Professor Layton and the Diabolical Box does not go easy on you with the puzzles either. Sure the first ones are simple, but they are luring you into a false sense of security. Before you know it – BAM! – where did that come from? Oh, its just another puzzle, but this time it’s a lot worse. Each puzzle you solve gets you picarats. Every puzzle is worth a certain amount of picarats, and if you solve it with the correct answer the first time you’ll get them all. If not, the number will decrease each time you try to solve it and fail. Professor Layton and the Diabolical Box looks amazing. While the graphics haven’t really changed from Professor Layton and the Curious Village, they have added a whole mess of beautifully animated cut scenes. They flow smoothly and look like something from TV. The character design also retains the charm from the first game, simple and strange. Sound-wise Professor Layton and the Diabolical Box is just as great as the graphics. The music fits each scene perfectly and stands out while not over powering the game. From the eerie music box music to the jaunty accordion jams, everything is spot on. Professor Layton and the Diabolical Box is fun, however, it’s not hack n’ slash or RPG fun. The fun is smarter and more subdued. Can you solve the next puzzle, sort of fun, and it’s not for everyone. If you want something to make you think (this is why they said you needed to take math in school!) then this is a great game. It reminds me of some of the awesome puzzlers from years past, Solomon’s Key and The Adventure’s of Lolo, but the puzzles are of a different variety. However, at times the puzzles seem a bit unbalanced and the picarat rating system is a little arbitrary. Professor Layton and the Diabolical Box is a great game. If you liked Professor Layton and the Curious Village, or you like puzzles in general, try this awesome DS game. While it is not for everyone, it is a gem for those who can appreciate it.